Korean artist Osang Gwon skillfully straddles the mediums of photography and sculpture in a rich and complex signature style that seems to nod to Pop Art, traditional still life painting and portraiture through a most contemporary vocabulary that finds its roots in such far-flung philosophical underpinnings as the fractured bodies of world history, the sutured surfaces of Dadaist collage and the mise en scène fabrications of the stage. And in hypothesizing that Gwon’s work is staged in purely theatrical terms, one may view his multilayered constructions as hybrid images that encapsulate both leading role and backdrop under the unified rubric of vision, for we indeed see a narrative unfold (and fold unto itself) before in space us as our eyes skim the pieced-together skins and veneers of his most intellectual and aesthetic endeavors. Put simply, Osang Gwon redefines the ways our eyes understand that which normally plays out before them; he mimics reality through restructuring it, at times making the two-dimensional three and the three-dimensional two, and all the while allowing the cracks of his labor to show. Indeed, restructuring the collective vision of a given time and place is nothing new to the history of art. The Impressionists re-envisioned the reality of an ever-accelerating society as laid out by the Industrial Revolution and its churning motors that forever instilled a blurring speed to the landscape as viewed from a chugging locomotive’s compartments. The Dadaists forced their audiences to revel in the mundane and the absurd, to in fact redefine both visually and theoretically what value an ascribed work of art, often in the form of a ready-made object or pieced together collage, would hold once presented as such. Further, the Surrealists created landscapes of the far reaches of the mind, environs of pure whimsy and decay that could never exist in reality, yet that fully reflected the war-stricken nature of the moment. Decades later, the Abstract Expressionists boiled the act of making art down to rhythmic gesture and the unconscious mind; no longer was it necessary for art to be figurative or representative—now the motions and emotions of paint itself were enough to hold muster, and indeed to take over all that preceded it. Still yet, Pop Art, Minimalism and the dozens of other artistic movements that have arisen over the past 50 years all in their own way reordered our collective vision. Yet again, and in a truly novel light, Osang Gwon has combined aspects of nearly all of the above-noted “isms” of art history into a personal style that relies on the canon, just as much as it rewrites, challenges and undermines it in equal measure. And although his work is not easily categorized under the overarching headings of Photography or Sculpture, it somehow lives between the two, simultaneously inhabiting and being the crack which divides these powerhouse monikers of the house of art. Returning to the theatrical base of Gwon’s work, it might best be said that, as in his much discussed “Deodorant Type” series, he creates actors upon a stage (here the gallery) in pieced-together photographic constructs in an attempt to develop a slightly “off” character that is positioned well beyond the core demeanor of his very real models that he shoots from head to toe in a deeply intimate photographic exploration of the entire human form and all of its decorative trappings. Both literally and figuratively, Gwon builds his characters from scratch, picture by picture, as though a modern day Dr. Frankenstein hell-bent on creating new life from whence there was none. The developed paper upon which a graft of skin here or a swatch of fabric there is captured becomes the basic building block with which Gwon endeavors to recreate life, yet certainly not in its original form. The collage work of Claude Cahun from the 1930s certainly comes to mind, set as she was on giving birth to alternate bodies in her work, all to subvert the status quo. And yet Osang Gwon jettisons attempts at subversion in favor of critique; for him, the actors which he births into the reified realm of art are everyman, the common shopper in one case, a pensive woman in another. By serving up that which is supposed to be commonplace, and yet scarred and clearly not natural, he urges the viewer to realize that life and all of its social components—from the clothes we wear, the things we buy and the way we hold ourselves—are social constructs which are learned, dedicated to memory and re-performed on a daily basis. In fact, the title of the series comes from Gwon’s fascination with the marketing of Western deodorants in Asia, a place where only a small fraction of the population has a problem with body odor. Deodorant, then, is out of place in Asia, even though it is readily available. Extending this further, he thus makes us question the skin we are in, both canonizing and critiquing the au currant aspects of life—force-fed as they are—in the early 21st-century. Fashion certainly plays a primary role in Gwon’s production, but his work is not simply an attempt to provide a glimpse of urban street style. Politics, too, I would venture, is at play here. Thanks to the ever-present fissures and seams that mark the points of contact between the hundreds of photographs that compose his figures’ corporeal forms, an ever-present sense of violence and trauma is embedded in the glossy veneers of Gwon’s actors. And certainly the notions of war, terrorism and global security are nothing new to us, embroiled as our current world is in conflict and military maneuvers. Whether it be the reality of broken bodies on the field of combat, or those in the midst of our urban centers when a terrorist’s bomb maims, imagery of broken bodies has become standard issue in mainstream news outlets, and unfortunately on a near daily basis. 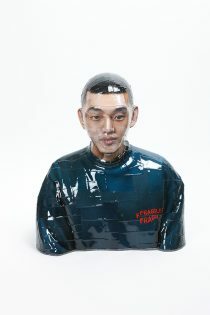 By literally presenting scarred forms that seem to have been pieced back together again a la Humpty Dumpty or Shelley’s famed monster, Osang Gwon both acknowledges the lived tragedies of our times and provides hope that things might one day get better and come back to some (albeit imperfect) sense of normalcy. Gwon’s critical stance on vision and materiality also plays out in his series “The Flat.” With imagery culled from the editorials and advertisements of high-end fashion magazines, Gwon creates an apparently flat wall of luxury repeatedly throughout the series. Whether it be fabulously expensive watches, luxury perfumes and creams, or jewels and baubles of exorbitant cost, works in “The Flat” become fields of consumerism writ large as the entire picture plane becomes completely populated with the markers of excess and brand-name logos. This is of course nothing new in an age where contemporary artists like Japanese wunderkind Takashi Murakami and American art star Richard Prince help the venerable French luxury retailer Louis Vuitton sell its high-priced purses with their much-sought-after designs. Yet, Osang Gwon is not interested in creating new motifs for commercial applications; it is the products themselves that he takes up to address the sheer saturation of life today with brand logos and must-have accessories. And although his photographs appear to be collaged assemblages of all-out consumption, they are actually sculptures first and foremost. 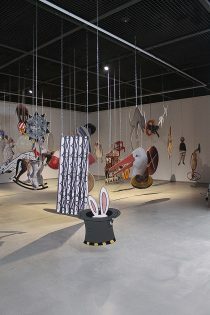 For, in fact, Gwon creates stand-up cut-outs of each item—blown up to super-size—and arranges them in a large space in his studio, stretching out and back several feet in all directions. By placing the camera directly in front of and on the same level as his constructed sea of conspicuous consumption, Gwon achieves a flat picture where all products appear to be on the same plane, when in fact they originally occupied a variety of positions and sizes in real space. Again, Gwon subverts our known reference points to visually accessing imagery, forcing us to question that before our eyes. As a critique of the upper echelons of the retail world, “The Flat” series might inspire us to think twice about spending too much on the latest fad, or in some cases might compel us to dive right in and buy, such is the sheer beauty of the glowing bounty contained within. Yet, and more importantly, the series makes us question the concept of materiality itself; both in terms of the materials from which a work of art are made as well as the materialism of life in the world today. Osang Gwon serves up this series in the language of advertisements and display; the way we choose to read it is purely individual and based primarily on our own predilections—and spending habits. As discussed earlier, Gwon’s work somehow presents objects as both primary actors and prime components of the sets upon which they play. 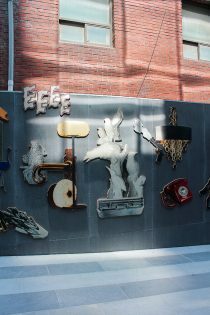 Especially with “The Flat” series, individual items may populate the picture-sculpture, but taken together, they become pure wallpaper, a stage set of all-out glitz. 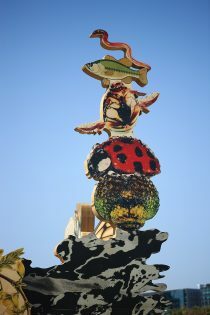 In much the same vein, characters in the “Deodorant Type” series may appear to be stand-alone identities, but thanks to the very nature of their piecemeal construction they ultimately appear arranged, as though they are carefully thought-out backdrops against which living and breathing bodies (i.e. the viewer) might play out their own actions. 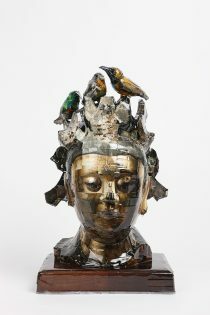 It seems then that Gwon is very aware of the interactions that his viewers will inevitably have with his work, whether fantasizing about being broken down component by component and then being rebuilt, or being set adrift on a window-shopping spree that can only result in the purchase of art, not the cardboard shells of haute culture/couture from which they are made. And in the end, we must realize, especially in today’s markets where art prices continue their upward climb, that in almost all aspects of life, our vision, and by extension, our judgment, often has strings (with price tags) attached. Osang Gwon is fully aware of this unavoidable component of the contemporary art world, and in his quest for describing and redefining the materiality of art, he inevitably reformulates the ways in which we see it. 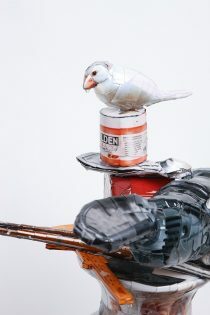 Indeed, in his series “The Sculpture,” he once again undermines our gaze by presenting us with luxury cars and their motors served up in candy-coated Technicolor, when in fact these very plastic-looking models are actually made from bronze which is then painted over with bursting hues. For example, The Sculpture 5 (2005) is a life-size bright orange Lamborghini that seems to still be wet thanks to its glistening—and lumpy, as in freshly modeled—surface. Only when the viewer reads the label or sneaks a touch does she realize that the car is in fact made from the most traditional of high art sculptural materials, bronze. Here too, Osong Gwon throws us a conceptual curve ball, tricking our eyes to believe one thing, when, in actuality, something quite the opposite is true. Thus thinking about Gwon’s work and all of its exquisite complexity, only a small portion of which I discussed above, it might be best to catalogue his work under the more apt concept of the manifold in lieu of such terminology as Photography or Sculpture. For in physics, the manifold is best described as that which allows complicated structures to be understood through simpler more common-place spaces. And that is exactly what Osang Gwon is attempting to do in his work, folding, manipulating and displaying a litany of complicated concepts as far-ranging as history, economics, materiality and human nature in a universal container that both mimics, and yet always and forever subverts, that which we think, or thought, we knew as truth. And in so doing, like the innovators who came before him, Osang Gwon gives us a new way of seeing, and indeed of knowing, the world around us. Eric C. Shiner is an independent curator and art historian specializing in Asian contemporary art. His scholarly focus is on the concept of bodily transformation in postwar Japanese photography, painting and performance art. Shiner was an assistant curator of the Yokohama Triennale 2001, Japan’s first ever large-scale exhibition of international contemporary art, the curator of Making a Home: Japanese Contemporary Artists in New York at Japan Society in 2007 and the co-curator of the exhibition Simulasian at the inaugural Asian Contemporary Art Fair, New York in November 2007. He is an active writer and translator, a contributing editor for Art AsiaPacific magazine, and an adjunct professor of Asian art history at Cooper Union, Pace University and Stony Brook University. 한국작가 권오상은 현대적인 표현형식을 통해 팝아트, 전통적 방식의 정물화, 인물사진에 상응하는 듯한 복합적이면서도 다양한 스타일로 사진과 조각이라는 두 매체 사이를 능수능란하게 넘나들고 있다. 이때 작품의 표현형식은 세계사의 파편적인 내용, 다다이스트 꼴라쥬에서 엿볼 수 있는 조각들을 이어 붙인 흔적, 미장센 구조와 같이 널리 알려진 철학적 토대에 그 뿌리를 두고 있다. 연극에서 사용되는 용어를 빌어 그의 작품을 ‘상영되는 것’이라 가정해보면, 관람자들은 하이브리드 이미지 즉 혼성적인 이미지들을 통해 작품의 다층화 된 구조를 인지하게 된다. 그리고 다층화 된 구조는 대상을 단일화하여 인식하려는 우리의 시각에 의해 주요한 역할을 하는 주연배우와 세트배경 모두가 한데 엮어진다. 왜냐하면 우리 눈은 사진 조각들로 이루어진 표면과 작가의 지적이면서도 미학적인 시도의 결과물인 베니어를 훑어보면서, 눈앞에 펼쳐진 것에 내러티브가 내포되어 있던지 그렇지 않던지 간에 그 속에서 어떠한 내러티브를 읽어내려 한다. 다시 말해 권오상은 관람자의 눈이 베니어나 사진조각들로 이루어진 작품 표면을 바라보면서 대상을 이해하게 되는 방식을 재정의 하고자 시도하는 것이다. 그는 때때로 2차원적 3차원의 대상과 3차원적 2차원의 대상을 만들고 작가의 흔적이라 할 수 있는 이어 붙인 수많은 조각들 사이의 틈을 그대로 보여줌으로써 관람자의 시선이 대상을 인식하는 방법을 재구성하며 현실을 조롱한다. 주어진 시간과 장소에서 총체적인 시각을 재구성하는 것은 미술사에 비추어 볼 때 그리 새로운 시도는 아니다. 인상파들은 산업혁명과 재빠르게 돌아가는 모터들에 의해 끊임없이 변화해나가는 사회현실을 마음속으로 다시금 그려냈다. 이러한 현실은 기차소리를 내며 달리는 기관차 안에서 보여지는 재빠르게 스쳐지나가는 흐릿한 풍경이 서서히 우리에게 익숙해지도록 만들었다. 다다이스트들은 관객들로 하여금 평범함과 부조리함을 밝히고, 레디메이드 오브제나 작은 조각들을 한데 모은 꼴라쥬의 형태에서 무엇이 예술작품이라 간주되는 것의 가치를 평가하는지 시각적으로 그리고 이론적으로 재정의 해보도록 유도하였다. 게다가 초현실주의자들은 일시적인 기분이나 이것의 쇠퇴에 영향을 주는 의식 아래의 사유에 이르는 것들을 표현해냈다. 이는 결코 현실에서는 존재할 수 없지만 어떠한 순간 전쟁의 공포에 사로잡힌 상태를 반영하게 된다. 그로부터 10년 뒤 추상표현주의자들은 예술작품을 만드는 행위에서 리드미컬한 움직임과 무의식적인 심상을 이끌어내고자 하였다. 예술은 더 이상 무엇인가를 비유적으로 표현하거나 재현하는 것이 아니라, 그림 그리는 행위 그 자체의 움직임이다. 그리고 여전히 팝아트, 미니멀리즘, 그 밖의 수많은 예술사적 움직임은 지난 50년이 넘는 세월 동안 우리의 총체적인 시각을 재배열하고자 하는 독자적인 방법에 찾아왔다. 특히 진정으로 참신한 빛줄기라 할 수 있는 권오상은 위에서 언급한 “예술사적 사조(-ism)” 들과 작가 개인의 스타일을 결합시켰다. 그는 전통적인 규칙인 캐논을 고수는 하면서도 동일한 방법으로 이를 위태롭게 하여 캐논을 다시 써내려갈 만큼의 새로운 시도를 한다. 비록 그의 작품은 사진이나 조각 중 하나의 영역으로 쉽사리 분류될 수는 없지만, 예술이라는 큰 지붕 아래 사진과 조각을 구별하는 틈 사이 즉 두 영역 사이에 존재한다고 볼 수 있다. 다시 권오상 작품의 연극적인 요소로 되돌아가 보면, 사람들에게 가장 많이 회자되는 “데오도란트 타입(Deodorant Type)” 시리즈는 갤러리라는 무대 위에 사진 조각들을 한데 모아 만든 사진적 구조물로 된 배우를 만들어가는 것이다. 이는 실제 모델을 능가하는 포즈를 취하고 있는 실제와는 아주 조금 다른 인물로, 머리에서 발끝까지 전체적인 사람의 형태와 옷차림이 잘 나타나도록 상세하게 촬영된 사진으로 이루어져있다. 사실상 권오상은 촬영을 통해 사진을 얻고 이를 모아 캐릭터들을 만들어내는데, 그는 마치 아무것도 없는 곳에서 새로운 생명을 창조해내리라 결심한 현대판 프랭크슈타인과 같다. 인화된 사진은 생명을 재창조하려는 작가의 노력과 함께 건물을 쌓아 올리기 위한 기초벽돌이 될 것이다. 그렇지만 분명 원래 그대로의 모습은 아니다. 이는 1930년대 클로드 카훈(Claude Cahun)의 꼴라쥬 작업을 떠오르게 한다. 카훈은 작품 속에서 성별이 엇갈리도록 분장하여 성별이 모호해져버린 신체에 생명을 부여해줌으로써 현재 그대로의 상태를 전복시킨다. 그러나 권오상은 단순히 비평을 위해 전복을 시도하는 것은 아니다. 그에게 있어 예술이라는 구체적인 영역에 생명을 불어 넣어주는 모든 사람이 작품 속 배우가 될 수 있다. 즉 어떤 경우에는 일반적인 쇼핑객이나 생각에 잠긴 여자도 그의 배우가 될 수 있다는 것이다. 평범하다고 생각될 수 있지만 어떠한 흔적이 남아있는 결코 자연스럽지 않은 대상을 제시해줌으로써, 관람자로 하여금 인생과 사회의 구성요소 대부분이 사회적 산물이라는 것을 자각할 수 있도록 유도한다. 우리가 입는 옷, 우리가 소비하는 것, 우리 스스로가 어떤 상태에 처해있도록 하는 이 모든 것이 학습되고 각인되어 매일매일 반복되는 것이다. 사실 데오도란트 타입 시리즈의 제목 ‘데오도란트’는 인구의 소수만이 체취 문제를 고민하고 있는 아시아에서의 서양 방취제 시장에 대한 작가의 관심에서 비롯된 것이다. 비록 방취제가 효과가 있을지라도 아시아인들에게는 좀 거리감이 있다. 이를 좀 더 확장해서 생각해보면, 작가는 21세기를 살아가는 우리들에게 일상의 평범한 측면을 평가해보고 규범화시키려는 일환으로 우리를 감싸고 있는 피부에 대해 다시 한번 생각해보도록 유도하는 것이다. 권오상의 작품에서 패션은 단순히 도시 거리의 패션 스타일을 보여주려는 것이 아니라 하나의 중요한 역할을 한다. 너무 과감한 해석일지 모르지만, 패션에 정치적 책략이 작용하고 있다고 보여진다. 작품의 형태를 이루는 수백 장의 사진조각들을 이어 붙이면서 생긴 갈라진 틈과 이어붙인 자국으로 인해, 폭력과 트라우마의 의미가 권오상 작품의 배우 즉 인물상의 반짝이는 베니어 속 깊이 새겨지게 된다. 전쟁, 테러리즘, 세계 안전이라는 개념은 결코 우리에게 낯선 것들이 아니다. 왜냐하면 현실세계는 전쟁과 군사적 전략으로 뒤얽혀있기 때문이다. 사진 조각을 이어붙인 자국이 있는 작가의 인물상은 전쟁터에서의 파편화된 신체 혹은 도시 한복판에서 일어나는 테러리스트의 폭탄테러에 의해 파편화된 실제의 신체이든 그렇지 않든, 파편화된 신체 이미지는 불행히도 거의 매일 매일 이슈로 다루어지면서 주요 뉴스 방송국의 일반적인 논점이 되어버렸다. 작가는 수많은 조각들이 다시금 험피 덤피(Humpty Dumpty)나 메리 셸리(Marry W. Shelley)가 쓴 소설 속 괴물 프랑켄슈타인과 같은 모습으로 되돌아갈 수 있는 것처럼 보여지는 이어붙인 흔적 즉 봉합된 자국을 있는 그대로 드러내고 있다. 이는 우리 시대의 살아있는 비극을 자인하는 동시에 언젠가는 좀 더 나아질 것이고 완벽하지는 않더라도 정상의 상태로 되돌아 갈 것이라는 희망을 제시해주는 것이라 생각된다. 시각과 물질성에 대한 작가의 비판적 태도는 “더 플랫(The Flat)” 시리즈까지도 계속된다. 이 시리즈에서 권오상은 최고급 패션 잡지와 사설에서 모은 이미지들을 이용하여 호화스러워 보이는 평평한 벽을 만들어 나간다. 수집한 이미지들은 사치스러운 시계, 값비싼 향수나 크림, 엄청난 가격대의 보석과 작은 장식물들이다. “더 플랫” 시리즈 작품은 화면 전체가 브랜드 로고와 과도한 이미지들로 가득 찬 소비자중심주의의 커다란 공문서처럼 여겨진다. 물론 이러한 것이 요즘 새로운 것은 아니다. 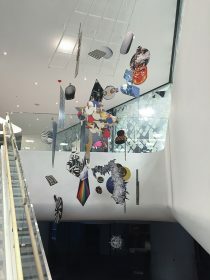 일본에서 유명세를 타고 있는 타카시 무라카미(Takashi Murakami)와 미국의 스타작가 리차드 프린스(Richard Prince)는 프랑스 뤼비통과 협력하여 해당 브랜드의 고가 지갑을 판매할 수 있도록 도와주고 있기 때문이다. 그러나 권오상 작가는 상업적인 목적을 위한 새로운 모티브를 만들어 내는 것에는 별 관심이 없다. 브랜드 로고와 필수 아이템으로 간주되는 악세서리들로 가득한 그의 작품은 오늘날 삶의 포화상태를 설명해주고 있는 생산물 그 자체라 할 수 있다. 비록 그의 사진은 완전한 소비재의 이미지들이 꼴라쥬되어 만들어진 작품처럼 보일지라도, 실제로 이것은 조각이라 할 수 있다. 사실 권오상은 각각의 확대된 사진들을 오려내고 이를 사방으로 몇 피트나 되는 넓은 스튜디오 공간에 세워서 배열한다. 이때 카메라를 정면에 두고 소비재가 잘 보이도록 구성해놓은 넓은 공간이 동일하게 보이도록 카메라 앵글을 조절함으로써 작가는 모든 물체가 동일한 평면 위에 놓여있는 것처럼 보이는 평평한 이미지를 만들어낼 수 있게 된다. 그러나 사실 이 모든 이미지들은 실제 공간에서 다양한 크기를 갖고 다양한 위치에 놓여져 있다. 즉 작가는 보여지는 시각적 이미지에서 알 수 있는 사실을 전복시키고 우리들로 하여금 눈앞에 있는 것에 대해 의구심을 갖도록 유도한다. 위에서 언급했던 것처럼 작품 속에 배치된 작은 세상을 통해 “더 플랫” 시리즈는 최신 유행을 쫓아 너무 많은 것을 소비하는 것에 대해 다시 한번 생각해보도록 한다. 동시에, 우리로 하여금 작품 속 소비재에 몰두하고 이를 구매하고자 하는 욕망을 갖도록 유도하기도 하는데, 이는 작품 속 대상의 절대적인 아름다움 때문이다. 여기서 좀 더 중요한 것은 이 시리즈는 예술작품을 만들어내는 물질(materials)이라는 단어, 오늘날의 물질주의(materialism)라는 단어와 연관이 있는 물질성(materiality)이라는 개념 자체에 대해 의문을 품게 한다는 것이다. 작가는 광고와 디스플레이라는 수단을 통해 “더 플랫” 시리즈를 전개해나가고 있는데, 우리가 이 작품을 읽어나가기 위해 선택하는 방법은 순전히 개인적이고, 근본적인 우리 자신의 선호도나 소비습관에 근간을 두고 있다고 할 수 있다. 앞에서도 언급했듯이, 권오상 작가는 작품을 배우로서 그리고 그들이 연기하는 무대의 최고의 구성요소로 제시한다. 특히 “더 플랫” 시리즈에서 각각의 사물들은 그림 이미지로 된 조각이기도 하지만 이것들을 한데 모으면 완전한 하나의 벽지 혹은 현란한 무대가 되는 것이다. 이와 유사한 측면에서, “데오도란트 타입” 시리즈의 인물상들은 독립적인 아이덴티티를 갖고 있는 것으로 보일지 모른다. 그러나 이 시리즈의 대상들은 재구성된 것처럼 보이게 하는 조각조각의 단편적 구성요소 때문에 살아 숨쉬는 신체인 관람자가 그들 자신만의 행위를 취하는 것과 대비되며 마치 배경처럼 여겨지기도 한다. 즉 작가는 관람자가 자신의 작품과 피할 수 없는 상호작용을 하게 된다는 것을 제대로 인식하고 있는 듯하다. 관람자가 파편화된 조각과 이를 재구성하는 것에 대해 상상하던지, 물건은 사지 않고 구경만하는 사람과 같이 관조하는 상태이던지 이는 평범한 고급문화의 껍데기가 아닌 예술을 향유하는 결과를 낳는다. 마지막으로 작품가격이 계속해서 상승곡선을 그리고 있는 오늘날의 시장에서 우리의 바라보는 시각과 판단은 종종 가격표와 함께 이어진 끈을 갖고 있다는 사실을 깨달아야 한다. 권오상은 현대예술의 피할 수 없는 구성요소를 완전히 인식하고 있다. 그리고 작품의 물질성을 설명하고 재정의 하기 위한 노력의 일환으로 관람자가 예술작품을 바라보는 방법을 재구성하려 한다. 즉 “더 스컬프쳐” 시리즈를 통해 우리 앞에 화려한 색과 반짝이게 코팅된 값비싼 차를 보여줌으로써 다시 한번 관람자들의 응시를 위태롭게 한다. 플라스틱처럼 보이는 대상은 실제로 브론즈로 만들어지고 그 위에 화려한 색이 입혀진 것이다. 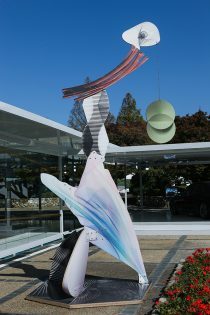 예를 들어 실물 크기의 오렌지색 람보르기니인 The Sculpture 5 (2005)는 새롭게 선보여지는 것처럼 반짝이는 표면 때문에 여전히 표면의 페인트가 마르지 않은 것처럼 보인다. 관람자들은 설명을 읽거나 몰래 살짝 작품을 만져보았을 때만이 이 자동차가 전통적으로 고급재료인 브론즈를 사용했다는 것을 깨닫게 된다. 여기서 작가는 다시 한번 우리의 눈이 실제 진실과 다른 어떠한 사실을 믿도록 속이는 변화구를 던지고 있는 것이다. 권오상의 작품과 그 정교한 복잡성에 대해 생각해볼 때, 내가 위에서 언급한 것들은 아주 작은 부분에 불과하다. 따라서 그의 작품은 사진이나 조각이라는 카테고리 보다는 다양성이라는 개념 아래 분류하는 것이 더욱더 적절하다고 생각된다. 물리학에서 다양성이라는 개념은 복잡한 구조를 단순하고 좀 더 이해하기 쉽게 서술할 때 사용된다. 권오상이 시도하고자 하는 것은 역사에서부터 경제학, 물질성, 인간본성에 이르는 복잡한 개념에 대한 설명을 계속해서 포장하고 조작하여 보여주려는 것이다. 또한 우리가 진실이라고 믿어왔고 지금도 그렇게 생각하는 것들을 조롱하고 이를 전복시키는 것이다. 물론 권오상 작가 이전의 선구자들도 그러했겠지만, 그는 우리가 잘 알고 있다고 생각하는 주변 세상이나 사물을 바라보는 새로운 방법을 제시해주고 있다. 에릭 샤이너(Eric C. Shiner)는 독립큐레이터이자, 아시아 현대미술을 전공한 미술사가이다. 그는 전후 일본의 사진작품, 회화, 퍼포먼스에 나타나는 신체변형에 대해 학구적인 관심을 보이고 있다. 샤이너는 일본에서 열린 대규모의 국제적 현대미술 전시회인 2001 요코하마 트리엔날레(Yokohama Triennale 2001)의 보조큐레이터(assistant curator)였다. 그리고 2007년 재팬 소사이어티(Japan Society)에서 열린 Making a Home: Japanese Contemporary Artists in New York 전시의 큐레이터, 2007년 뉴욕에서 처음 열린 아시아 컨템퍼러리 아트 페어(Asian Contemporary Art Fair)에서 Simulasian 전시의 협력큐레이터(co-curator)로 일했다. 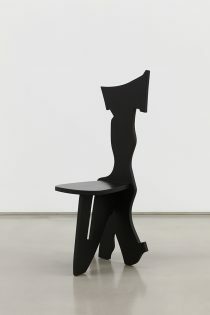 현재 그는 비평가이자 번역가로 활동 중이며 아트 아시아 퍼시픽(Art Asia Pacific) 잡지의 객원편집자, 쿠퍼 유니온 대학교(Cooper Union), 페이스대학교(Pace University), 스토니브룩대학교(Stony Brook University)에서 아시아 미술사를 가르치고 있는 조교수이기도 하다.